CAPTCHAs present a very controversial topic: you can’t do without them as a webmaster and you can’t stand them as a user. How to Write a Call-to-Action: Wondering What to Put on Your CTA Button? Download Dozens of Ideas! Just gread – love those with the big math challenge. Funny gallery of impossible CAPTCHAs. 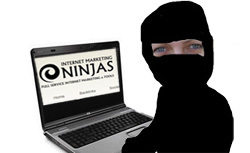 I did a post on this exact topic back in December title Is Your CAPTCHA Killing Your Business? Definitely the CAPTCHA is one of my biggest pet peeves when it comes to usability. The last mathematical capture is probably 0. Since inserting the value of pi for x gives numerical values for sin and cos not terms in x. And partial differential a number w.r.t. x is 0. P.S. The 2nd character in the 3d. landscape looks like an N to me. Nice capcha examples, great post. Whoops my mistake. x=Pi is after the partial differentiation. I’m surprised to your finds again and again. They looks so simple but very interesting. I think that is a really killer post. 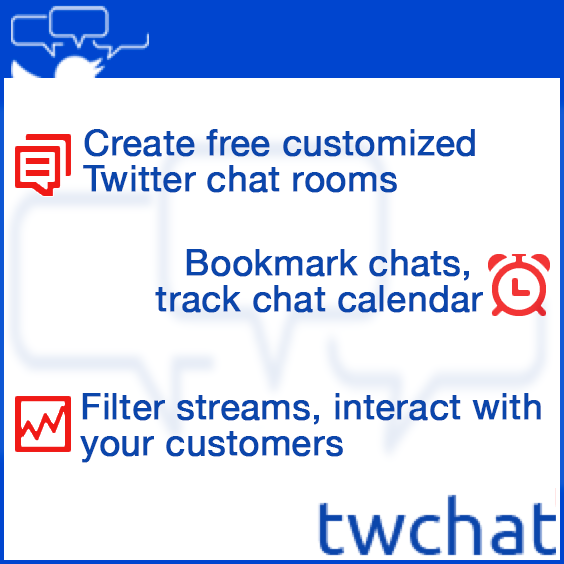 Twitit and bookmark it on Delicious. Hysterical! Thanks so much for finding these. 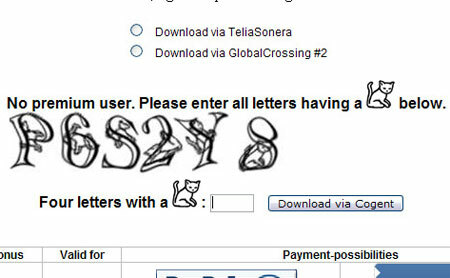 Given our line of work, I’m always collecting funny and impossible CAPTCHAs. The Matrix stream and 3D terrain are among my new favorites! You’re also right that it doesn’t matter if it’s a human or bot doing the submitting, but not necessarily because the puzzles are too complex. In the past few years spammers and hackers have started hiring teams of workers to submit spam/abuse to Web forms for pennies (even for forms that don’t use any kind of CATPCHA). Wow what an unusual collection. I have never come across most of these captures before – very amusing! I have a more interesting captcha, I hope. What a funny article! But I like it very much. Would let me introduce it on my blog(Japanese)? I’m sure to give credit to you and put a link to the post there. What a funny article! But I like it very much. Would you let me introduce it on my blog(Japanese)? I’m sure to give credit to you and put a link to the post there. On a more serious point… do you think that adding a captcha stops people from responding. 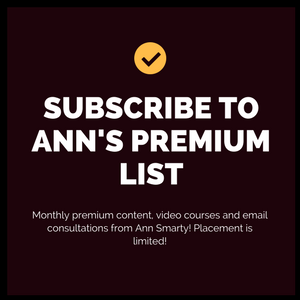 I know it only takes a few seconds to type in an easy to read one, but I’m sure some people can’t be bothered and your website misses a potential sale or contact. i had faced many probs filling CAPTCHA its really an eye teaser.. There may be a fun marketing angle here, especially for small niches. Especially if these form submissions wouldn’t be for lead submissions from potential customers. Maybe registering for an event would require a fun or specific question. An example would be an elite math club might require an equation to be solved. Ironic that the first post I read on Sphinn is this – registering with that site required a simple sum AND a character captcha and was so unclear it took 3 attempts to get past! That’s too funny. 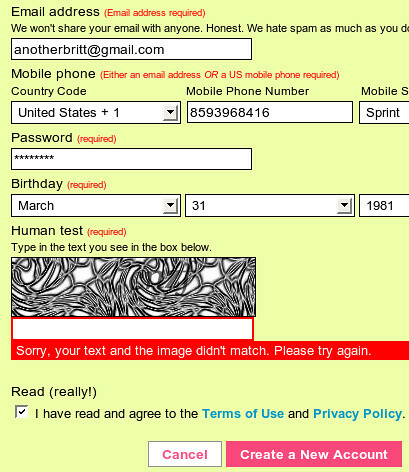 I understand CAPTCHAs are necessary, but some of them are hard to read!!! Hopefully someone can come with a decoder ring or some glasses for them soon. In the meanwhile I am using Twitter’s CAPTCHAs to name the songs on my upcoming album. There is very interesting, there is very fun. Its a thin line between stopping your hassle and killing any user interaction completely. 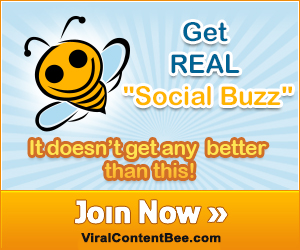 Comments and signups cannot be without any work or moderation can they, thats life! Cool! I saw the CAPTCHA Cats. It’s in Rapidshare.com, but their deactivated it. I believe that was because of the difficulty! LOL these are just too funny – thanks a lot for the list. So true.. 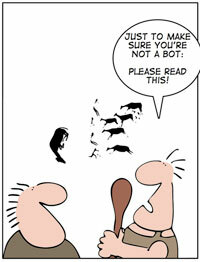 I have been fighting with my dev team on removing captcha from landing pages too.. I told them I myself have hard time reading it.. but they think tht am just making it up.. neways.. So true…I recently was requesting service from a website and I could not get the captcha to work. After leaving with a serious ding to my self esteem (turns out I’m not human). I emailed them. Never heard a response, guess I will go with someone else. 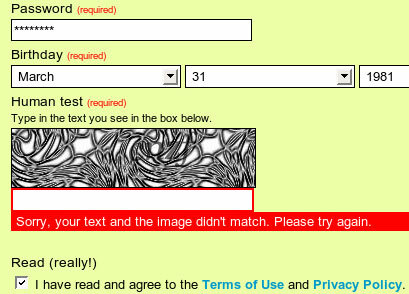 These captcha’s are really very impossible most of the times… It’s actually sometimes becoming irritating. Another one good post from you. The cats one is easy. But I simply cannot do the Magic Eye things. Never could. This CAPTCHA is impossible. This is very bad for site. Good Stuff. Some hard to read Captchas are so very annoying. 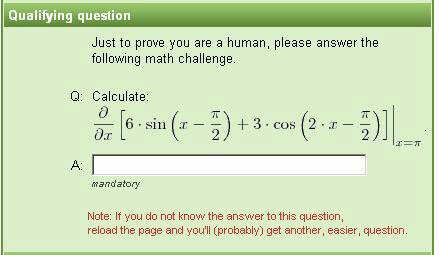 The one that looks like a calculus captcha is nuts! I have seen something similar trying to joining a money forum, but that’s beyond what I experienced there. My problem is that when it is straightforward to copy, the app itself malfunctions, too often. Reading it correctly can be one challenge. But when the combination of Arabic numerals and Capital letters is plain and unadorned and multiple tries still don’t work, it’s a common malfunction of a badly coded app. I tried last night to Contact Us to let them know that Captcha wasn’t working on their Site. Captcha blocked my letter of complaint about it. An impossible captcha proves to me the site only cares more about it’s few loyal readers then it does of capturing new audiences. I give the friendly back arrow a hard click and make a note of myself never to visit any blog that is hosted by that site. For example Soft Pedia has an impossible captcha asking you to solve an equation but then there is another number that has nothing attached to it that I don’t know what it’s there for unless I am not seeing something. Instead of making any real effort to stop spam the US Democrats just want to take freedom away by robbing Peter to pay Paul while turning a blind eye to the real problems. Saturday Night Live which usually is a Liberal show actually made fun of Hillary Clinton non stop for several hours having entire specials about her to make her look stupid. One of the Conservative talk shows mentioned it and I couldn’t stop laughing. I have entered Microsoft’s captcha enough times to circle the earth. It seems case sensitive, then not, so I give the audio a try-again, apparently I am hard of hearing-not-or amazingly dense-again, not. My question is how to determine what M. is after. Case sensitive? Random? Good luck? 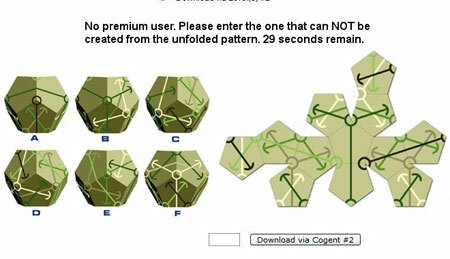 solving very difficult capchas have been my favourite online puzzles, but these ones prove nearly imposible. The worst ones yet are FUncaptchas, they are total 8HITE!! The hidden code in the picture is 438. UNBK in the 3d words? As for the others, my guess is as good as yours. How Much Does it Cost to Make a Blog (a Website)? Should You Change Your Profile Picture to Protect Your Privacy?